The malls are decked with Christmas baubles, Christmas wreaths and Christmassy stuffs. Gurney Plaza has a huge tree at the front entrance. I guess all the shopping malls are hoping to get us to spend eventhough there is the evil recession cloud hanging around us. I think I better start checking the regular frozen food supplier if the turkeys have landed. I hope to roast two turkeys this year. That is if the price is not too exhorbitant. I am buying a dumb bird call the turkey and not some golden goose, you know? P/S : My Nikon P4 point and shoot camera is wrecked. Now, I am without a convenient P&S camera for that quick, close-up photo of foods. Am looking for one below RM1K. Any recommendation? My regular camera shop let me compared a Canon and Fuji Finepix. Canon failed to measure up. The Fuji S60 with super CCD is great. Hahaha, I usually invite myself to somebody’s house and eat lah the turkey. You got open house or not? 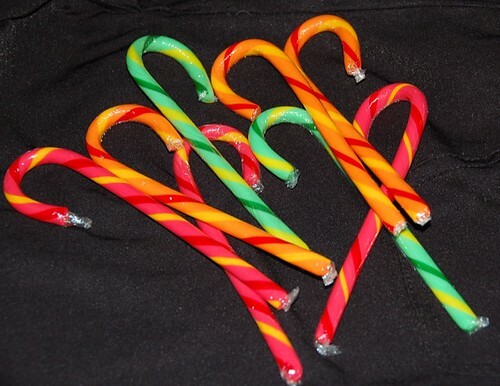 I always wonder about the candy canes and the big big lolipops. Do people really finish eating them? I think will die from the coloring and go hyper from the sugar. 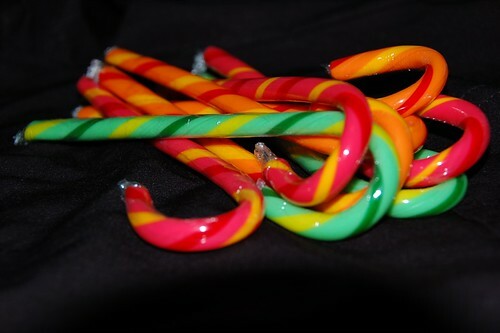 So who eats those candy canes?My teeth pain oredi thinking about it! !